For anyone teaching geography, urban planning, or public policy, the Brand New Subway game is a fun digital tool. 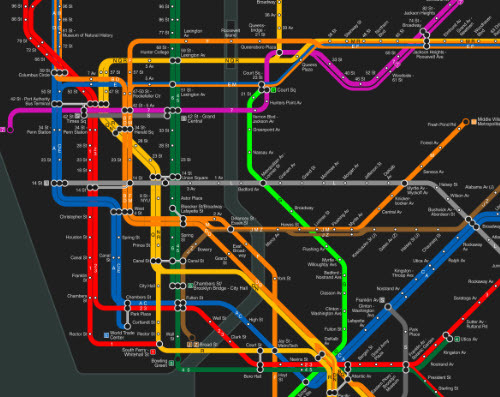 Created for a competition in honor of the book “The Power Broker,” it allows players to design New York City’s subway system. Players can create an entirely new system from scratch, or modify past, present, and future systems. The game also includes an option for creating subways from scratch for other U.S. cities. Players get three kinds of continuous feedback on their designs: the price of a single fare, the average weekly ridership, and the overall rating of the system. The overall goal is to design a system that attracts the largest number of riders and efficiently gets them to where they want to go at the lowest price. The trade-offs between ridership, operating cost, and system quality make the problem very difficult to solve. The game’s user interface is fairly easy to figure out and players can save works in progress. A simple way to use this game: have student teams compete against each other to build the best subway. Include as part of the competition a presentation where each team defends its design against questions from other teams. Next > Would you wiki?